For those without comedic tastes, the so-called experts at Wikipedia think they have an article about Thesaurus. A prime example of thesaurus use gone wrong. 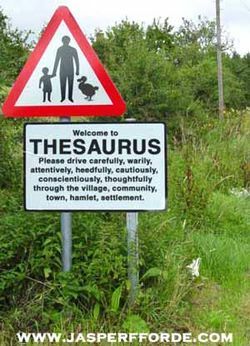 The word thesaurus is plagiaristic from 16th century New Latin, in rotate from Latin thesaurus, from very old Greek' thesauros, "lumber room", "bank account". Besides its connotation as a bank account or lumber room, it more commonly means an inventory of words with parallel, allied, or conflicting connotations (this new connotation of thesaurus dates back to Roget's Thesaurus). For illustration, a paperback of lingo for a expert meadow; or more technically a inventory of issue headings and cross-references second-hand in the filing and rescue of documents (or indeed papers, diplomas, epistles, cards, records, texts, files, articles, essays and perhaps even manuscripts), the flicks, sound CDs, machine-readable media, etc. Interestingly, no other word for thesaurus has yet been discovered. The Rationale of a thesaurus is to wholly raze any kind of sagacity to a document/text/file/article/essay/papers/deed/certificate/record. The reasons for this are not gamely perceptible, although the architect of the thesaurus is a confessed drug addict. This may or may not have been a causative dynamic to the inclusive and utter futility of thesauruses. Up-to-the-minute English teachers get pleasure from portentous students use thesauruses for assignments, on the grounds that it expands their vocabulary. The reason conversely is more likely to be that teachers enjoy failing the utter crap that is produced. The first illustration of this genre, Roget's Thesaurus, was available in 1852, having been amassed earlier, in 1805, by Peter Roget. Entries in Roget's Thesaurus are not inventoried alphabetically but conceptually and are a great reserve for writers. Although plus synonyms and antonyms, entries in a thesaurus ought not be occupied as a inventory of them. The entries are also calculated for doodling distinctions between parallel words and assisting in opting exactly the right word. Nor does a thesaurus entry characterize words. That employment is left to the dictionary. In Information Technology, a thesaurus embodies a database or inventory of semantically orthogonal topical “rummage around” keys. In the meadow of Artificial Intelligence, a thesaurus may sometimes be referred to as Ontology. Thesaurus databases, fashioned by interstate standards, are generally arranged ladderly by themes and topics. Such a thesaurus seats each term in milieu, allowing a user to distinguish between "bureau" the office and "bureau" the furniture. A thesaurus of this type is habitually second-hand as the basis of an index for online fabric. The Painting and Structure Design Thesaurus, for illustration, is second-hand to index the state databases of museums, Artefacts Canada, held by the Canadian Heritage Information Netemployment (CHIN). A set of allied terms for each term in the inventory. Terms are the basic semantic building-blocks for conveying concepts. They are usually single-word nouns, since nouns are the most concrete part of speech. Verbs can be converted to nouns -- tidiness to cleaning, reads to reading, and so on. Adjectives and adverbs, however, seldom convey any connotation useful for indexing. When a term is ambiguous, a “compass note” can be added to ensure uniformity, and give direction on how to interpret the term. Biologically, not every term needs a compass note, but their presence is of considerable help in using a thesaurus spot on-ly and reaching a spot on understanding of the given meadow of knowledge. Term affairs are links between terms that habitually describe synonyms, near-synonyms, or hierarchical relations. Synonyms and near-synonyms are pointed out by an Allied Term (RT). The way the term "Cybernetics" is allied to the term "Mainframes" is an illustration of such an affair. Hierarchical affairs are second-hand to indicate terms which are tapered and broader in compass. A Broader Term (BT) is a more general term, e.g. “Apparatus” is a generalization of “Mainframes”. Reciprocally, a Tapered Term (NT) is a more specific term, e.g. “Digital Mainframe” is a specialization of “Mainframe”. BT and NT are reciprocals; a broader term necessarily implies at least one other term which is tapered. Thesaurus designers are generally careful to ensure that BT and NT indicate class affairs, as distinguished from part-whole affairs. Some thesauri also include Use (USE) and Second-hand For (UF) indicators when an authorized term is to be second-hand for another, unauthorized, term; for illustration the entry for the authorized term "Frequency" could have the indicator "UF Pitch". Reciprocally, the entry for the unauthorized term "Pitch" would have the indicator "USE Frequency". So cute, you could just eat him right up. The name "Thesaurus" was originally coined, invented, created, and termed by the Geeks. The word was based on their Archaeological findings to date. The first known fossil of a Thesaurus (Lexicus Thesaurii) was found in 134 B.C. (B.C.E.). The creature was a biblivorous (book-eating) therapod which lived during the Lower Uncyclopedian era, the last stage of the Cretinous period, 66-65 million years ago. These dinosaurs would measure up to 15 cm in length and 5-10 grams in weight, Thesaurus was one of the largest biblivores of all time. Compared to others of its niche, the teeth of Thesaurus were heavily serrated, massive and oval in cross-section, heavy wear, and bite marks found on pages of older books, indicate that these teeth could tear into solid hardbacks. The teeth are often found worn or broken at the tips from heavy use, but unlike those of mammals, they were continually grown and shed throughout the life of the bibliovore. While Thesaurii appear to have had a sizable brain, with temporal lobes heavily modified for recording word meaning, syntax and etymology, it was probably not particularly intelligent by mammalian standards. This page was last edited on 4 August 2015, at 14:16.